I am utterly exhausted and a little annoyed. 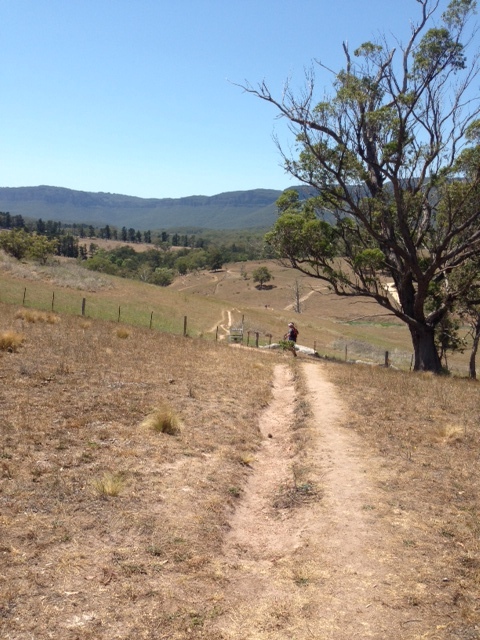 I busted my gut today hitting the hills of the Megalong Valley, and they weren’t ordinary hills let me tell you! Anyway, i’m not going to let that spoil the beauty of today’s run as it was a rough, tough experience as well as utterly beautiful. The day started off very foggy which was perfect as it kept us quite cool for the first half of the run. 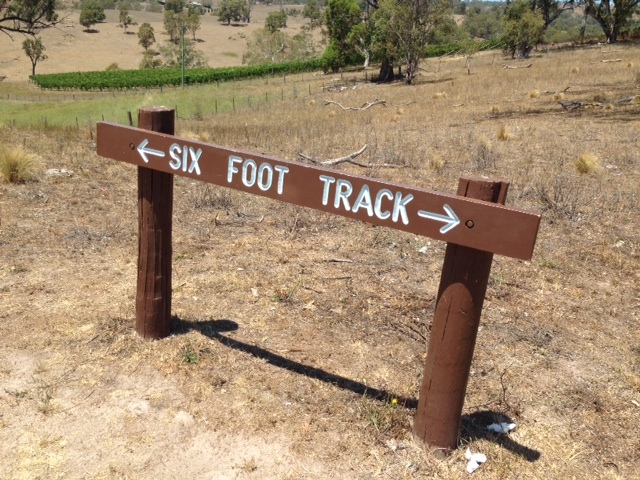 This was an out and back course, starting at the point where the Six Foot Track meets the Megalong Valley Road. Today we were also running with a group called FATASS. No seriously that’s there name, you can look it up! 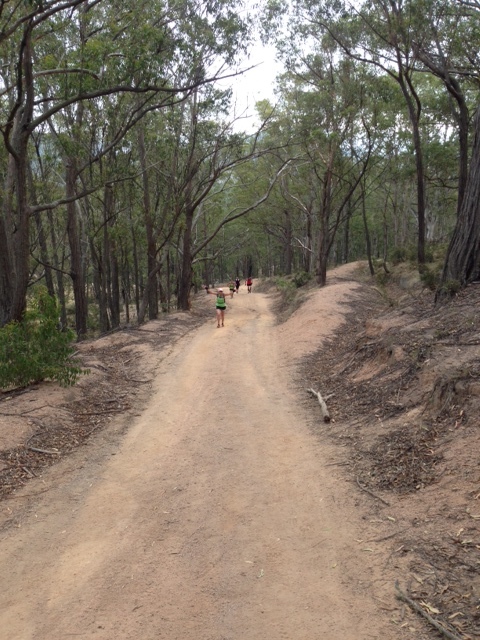 This course had hills, hills, hills, hills and some more hills. 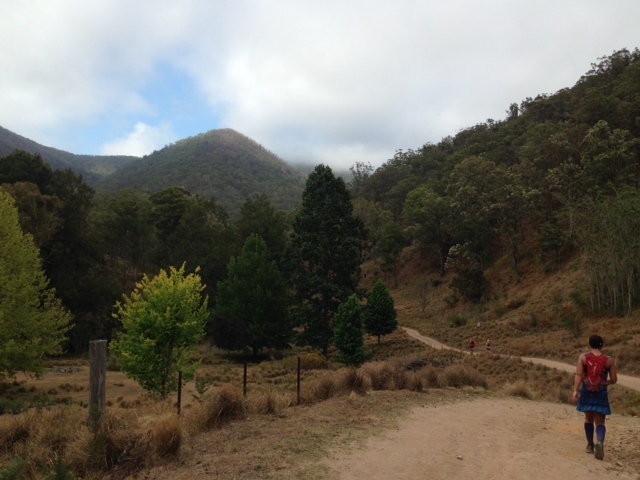 Plus a few river crossings, the main one being the Cox’s river which you can see in the shot below. The water wasn’t very high (just under my knees) but apparently the race had to be cancelled a few years back because the water was over 2 meters high! Let’s hope that’s not the case in a few months time. 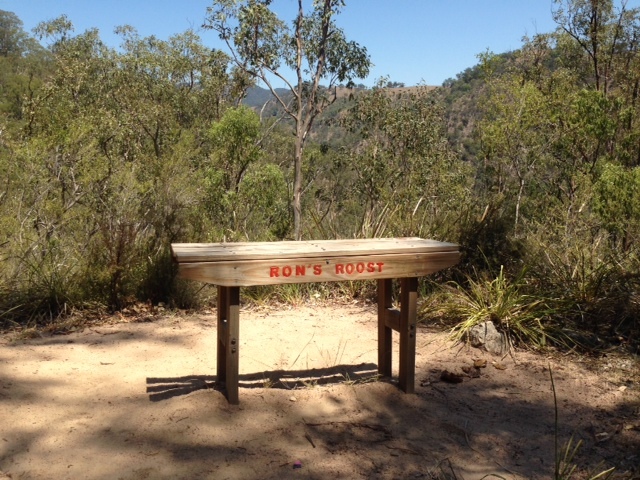 I also thought the obviously recently added “Ron’s Roost” was quite amusing and wondered who Ron was… I must look into this and ask a few of the other runners. Perhaps it’s one of the legends who has run this race ever since it’s inception. 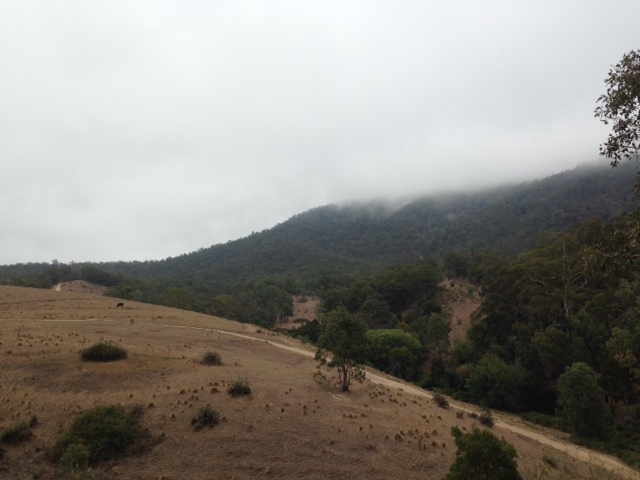 Below is a shot of our group-within-the-group coming up the final hill towards the Pluviometer. A very, very steep 4km uphill battle that you can only walk. The Pluviometer was our turn around point so we were all very relieved and excited when we got there. And below is the proof that we all made it to the Pluvi – a job well done by all. Then it was time to head back down the hill to the start. I managed to get some speed up on the way down the hill. Sometimes it’s easier not to fight with gravity and fall at some speed keeping soft on the knees. I felt great going down those hills, like i was flying and I actually got quite a way ahead of our group for a while but once we hit the flat a few of the girls caught up and we kept moving. 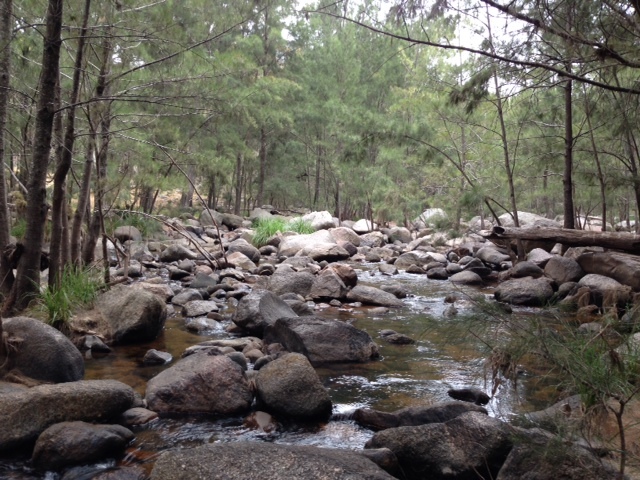 We hit the Cox’s river for the second time and found our drinks that we had stashed earlier. I had frozen a gatorade the night before and we had put all our drinks in the river when we ran past the first time. It kept them cool and we enjoyed them very much. 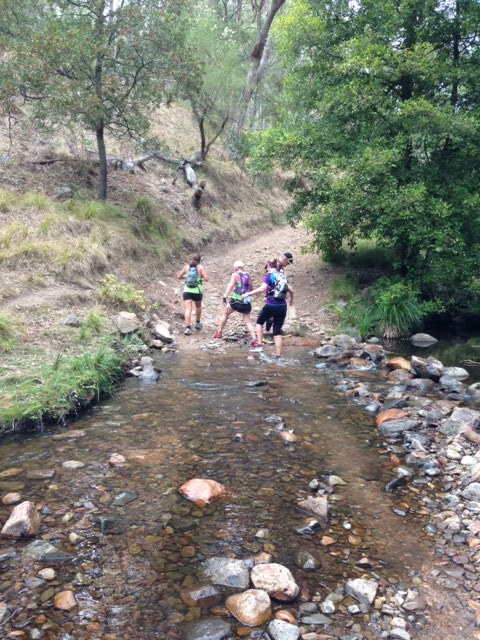 Once we were at this spot we knew there was only 7km to go…… so we decided to take 10 and enjoy the water……. The day was getting much hotter now the fog had cleared and the sun was beaming down on us. Once we got out in the open it was extremely warm and we were thankful to be on our way closer to the finish. 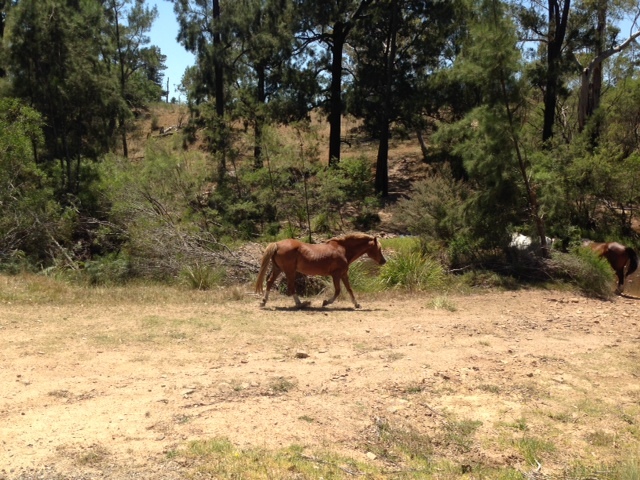 And finally I got chased by a horse today. At first I thought there was a runner behind me who was coming in fast and i was impressed but when turned around it was a beautiful brown horse trotting down behind me to meet his friends that were just ahead. He was beautiful & through my awe and fright I managed to get a pretty shot of it. If anyone wants more info or has questions feel free to post or comment and let me know what you’d like to hear more about in future. 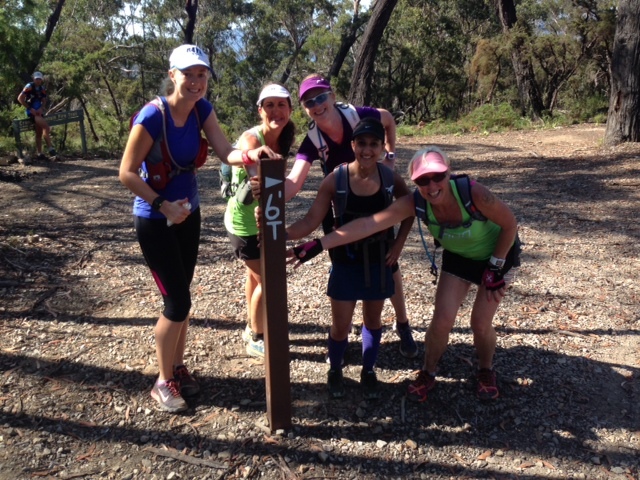 This entry was posted in Training Runs and tagged #running, blackheath, bluemountains, fatass, horses, megalongvalley, sydneystriders, trailrunning by laurenhailey. Bookmark the permalink. That looks like a beautiful place to run! It sure was. And somebody sent me a video of the river we crossed from a few years back and it was about 4 times the size and like rapids!! Hopefully it won’t be like that for our race day. Oops, I just realize I posted that as Leo The Great lol. Bad first impression.